Over a month ago, we took Ava for her first chiropractic appointment to a doctor that specializes in pediatrics and very trusted here in our area. In the first few minutes of the exam she told us that Ava has swollen lymph nodes, which is likely due to food sensitivity or allergy. The chiropractor suggested that we remove cows milk from her diet since that's usually the culprit. One of the reasons we took her to the chiropractor was because of snoring and irregular breathing. I told her we hadn't introduced it to her until she was 2-years old because of Aaron's sensitivity to cows milk. Since cows milk tends to increase mucus we thought it would help that symptom as well. I bought goat's milk cheese and yogurt and started to use coconut milk products too. Ava enjoys a fruit and yogurt smoothie, but I replaced cows milk yogurt with either goat's or coconut milk yogurt. That month, I packed many lunches since there's so much cheese and dairy on the menu at her school. On our family pizza night, I had to make her a personal size pizza with goat's milk and vegan cheese, but she didn't like it as much. I even made a dairy free lasagna with a mix of tofu and garlic as a replacement for ricotta cheese. It was fabulous by the way! After about a month of not eating cows milk, including her beloved Brown Cow Vanilla Yogurt, Ava still had swollen lymph nodes. The good news is that the combination of chiropractic treatment and elimination of cows milk have significantly improved her snoring and her breathing was regular when she slept at night. Ava's pediatrician ordered a blood test for food and environmental allergies because of the allergies on both sides of our families. We got the blood test results last week and it turns out she has a moderate allergy to eggs. We were thrilled to learn that she's not allergic to anything else, including cows milk. It is disappointing because Ava loves scrambled eggs and egg breakfast burritos. I went through the school menu with the cook at her school and our new game plan targets replacements for the breakfast items. I made egg-free pancakes, french toast, pancakes, and muffins for her to take to school and it worked out great! The pancakes were delicious! I pureed cooked millet and made them with almond milk and Egg Replacer. I stocked the leftovers in our freezer and plan to make ahead and restock as needed for Ava's school breakfasts. School lunch: hummus, pita chips, orange slices and smoke almonds. I packed lunch for her yesterday because they had breakfast for lunch. She loved her packed lunch. It's very interesting that even at her age the 3 and 4-year old children ask me why she's eating something different. 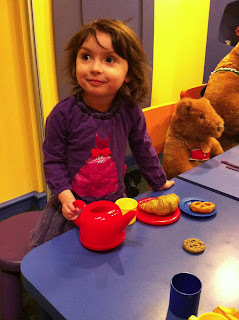 But Ava proudly brings her food in a new Princess lunch box! I got some ideas from Lisa of the blog 100 Days of Real Food and got some school lunch supplies from her recommendation list. We decided to not go overboard on Ava's dairy in take since we saw an improvement and it can't hurt to do less of dairy, given Aaron's sensitivity. She was so happy at Whole Foods last weekend when I told her we could buy her favorite yogurt! We also bought the local, low-temp pasteurization and grass fed cows milk from our Green Bean Delivery, which is supposed to be better for sensitivities. I think we're in a good place. And I'm thankful that we discovered this early in life and the transition is going well! I'll post some recipes on the blog when we find some that become our favorites! I feel for you and Ava with the blood testing - it broke my heart going through it with Charlie. But in the end, you are right, we can be thankful to know the cause and be able to learn to manage it when they are so young! We've recently started introducing some egg products into Charlie's diet, after completely eliminating them for about four months when he had a severe (not life threatening) reaction to his cake at his first birthday party. We've since concluded it was likely the cake icing that caused his reaction, not the actual cake and we're finding he's ok with cooked foods that contain eggs, even stove top pancakes. But eggs for breakfast, deviled eggs and egg white dessert are completely off limits. It made me nervous at first to knowingly give him foods containing egg ingredients but his allergy specialist suggested small exposures could ultimately help his body build a tolerance. We keep a close eye on his foods just the same and I pack his meals and snacks for daycare. We didn't get very adventurous with egg replacements but in that time I did start making an egg-free skillet lasagna. It does contain ricotta cheese, but it's continued to be a weeknight favorite because it's so quick. I'll send you the recipe, you could sub the ricotta with no problem I'm sure. The Berkey's are Food Composting and Gardening!